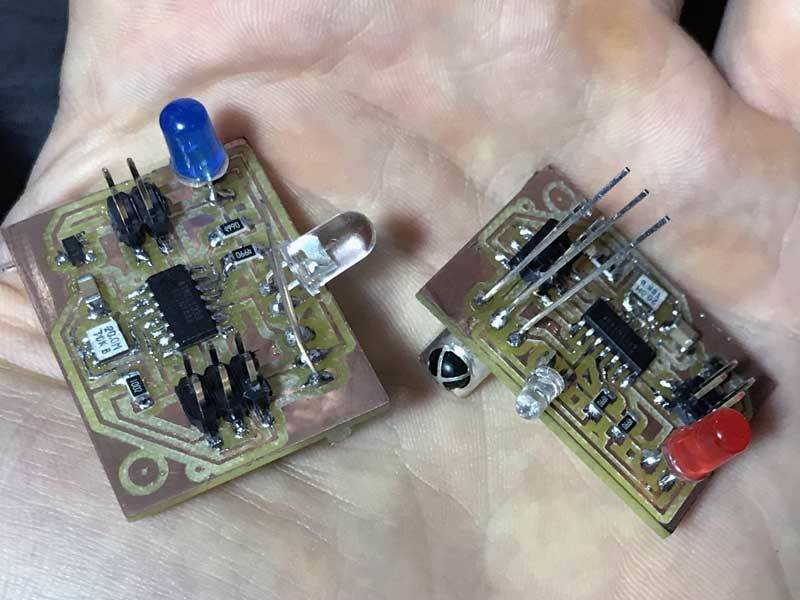 I was introduced to a project by Enrico Bassi which uses two ATMega boards connected to IR Sensors and IR LEDs to network by reading pauses in IR light (low). Upon seeing it, I was immediately impressed with the visceral qualities of networking with light. It is visible to our eyes! And, we could control a light in our hands to communicate to a machine. Admittedly, low tech stuff here. Remote controls... Plus, technically, we cannot see the light, the red LED on Bassi's board is for human reference, the IR LED is invisible to us. Regardless, as a first project to get into networking, I am game. I start by breaking down Bassi's work. This is an image from his Fab Academy page. I added the component labels. I would like to do the design part of this build quick. Get into the fabrication and coding and then circle knowledge back out. 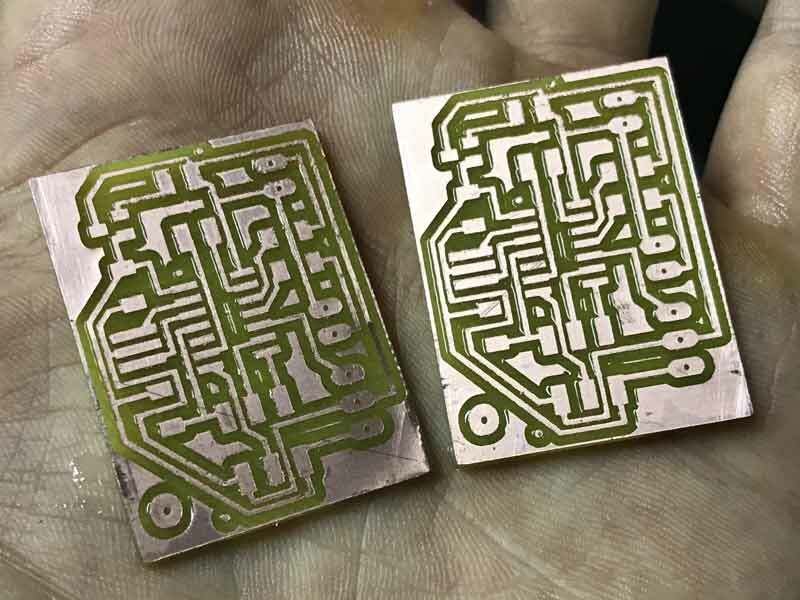 In my head, I plan to pull the components from the first boards I do and re-use them in more advanced boards, working my way up to fabricating my own special Fabkit. That in mind, I start making some mods to his board. The blue labels I plan to eliminate. 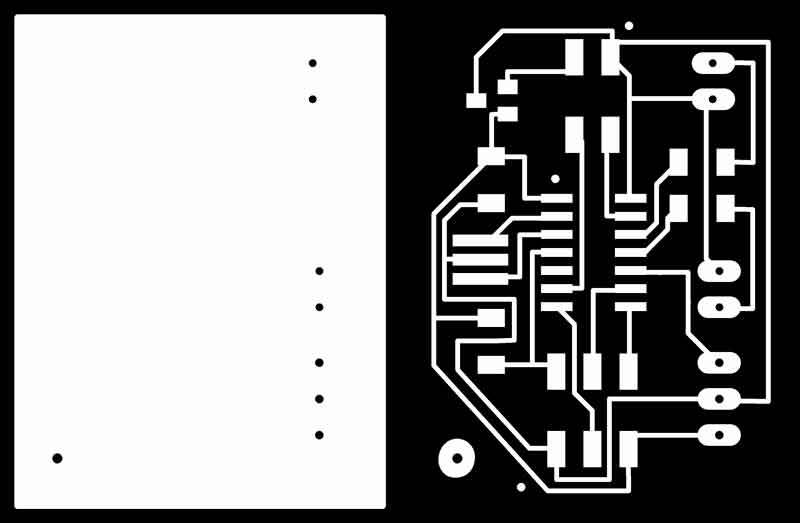 I prepared a schematic of the IR Networking board using an ATTiny44. I had an idea that I would pull all the off board connections to one header but I am not sure it is going to work. Either way, I do not think it is worth the time. I will return to the lab, double check the inventory for an IR sensor, customize the pads and split the header. 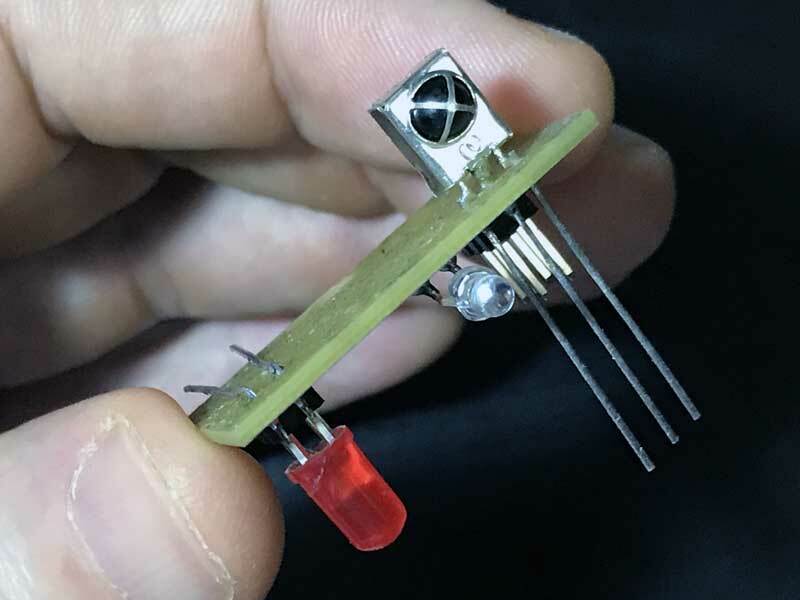 I redesigned the schematic with through holes for larger LEDs and the IR receiver I found in the Shanghai electronics market. Then I added an ISP header and another 2x2 for external power and RX/TX. Outline and traces look like this in the computer. Like this in my hand a few minutes later. And like this soldered a little while later still. I made a mistake when orientating the three pins for the IR sensor. I should have mirrored the pins. And to do that, I might have to rearrange the lights and sensor to accomplish the traces without any zero ohm resistors. For now, I need to keep moving forward. Enrico Bassi IR Network : Infrared lights in love. 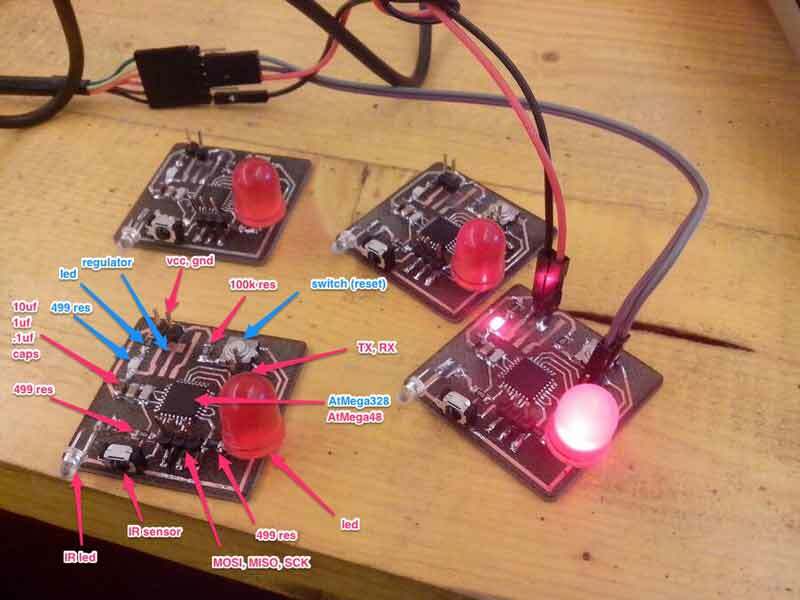 Rashid Thattayil IR Sensor using ATTiny 44 : Final project for Fab Academy. 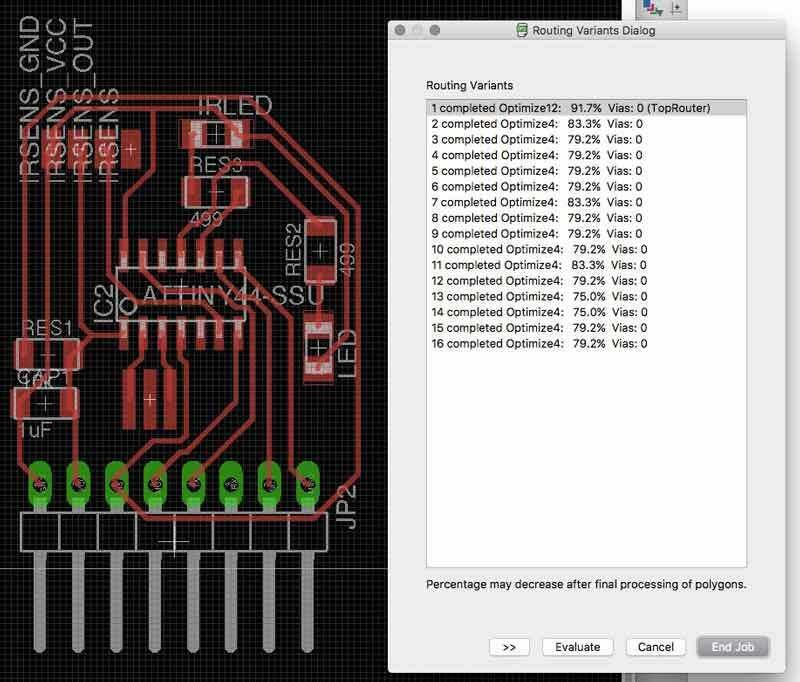 ATMega328 Pinouts : Use this to compare Bassi pins with my own.